Specialist in all aspects of wheel repairs NOW INCLUDING DIAMOND CUT FINISHES. Are your alloy wheels kerbed, cracked, pitted, corroded? We refurbish damaged alloy wheels and return them to as new condition. We cater for all makes and models and can reproduce all variant of original colour, custom paint and even repair diamond cut wheel finishes. Do your tyres lose pressure for no reason? It could be that your alloy wheels have corroded on the inside where the tyre seals to the rim. We media blast and paint the inner face of the wheel to cure the corrosion and stop the pressure loss. Are your wheels buckled or bent? With the increasing number of potholes on our roads there are an increasing number of alloys being damaged. We can straighten bent, dented or buckled alloys that have sustained damage from impacts such as potholes. 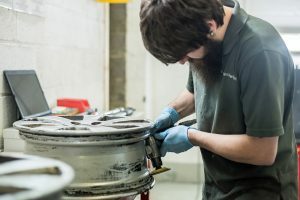 Cracked alloys can be TIG Welded and painted which can be a more cost-effective alternative to buying a replacementwheel. We offer a drive in – drive out service when having your wheels refurbished and can even offer use of a loan vehicle for £6.00 per day to keep you on the road. 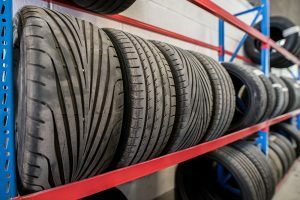 We supply and fit tyres at competitive prices so please ask a member of staff for a quote while we are working on your wheels. We are also Lincolnshire’s only authorized fitter and stockist of AlloyGator. Once we have refurbished your kerbed or cracked alloy wheels we can then protect them and keep them in perfect condition. Click here to find out more. Thanks for doing a fantastic job on refurbishing all my alloys, they look great and had loads of comments from people passing the car. Thanks once again.